I am contemplating a fantasy campaign where the PCs are people from our world (any time period) who are summoned (like demons) to a fantasy world. For reasons of my own, I do not want to deal with levels — classes would be okay, but levels would not work with the campaign idea I have in mind. Can you suggest a fantasy game that does not use levels as an advancement mechanic? Preferably one with lots of existing support (monsters, maybe a few adventure paths, that sort of thing). P.S. Not Fate or Savage Worlds. In GURPS, you can pack a lot of action into just a few seconds. But sometimes, you just need even more. While the various attack maneuvers let you strike a blow in the name of science (as an example), sometimes, due to a surfeit of targets or a surplus of awesomeness on your own part, you just want to hit twice. The rules provide four options to do this (five if you count Altered Time Rate, but that’s two whole turns for 100 points, so I’ll skip that). The first method for striking twice is the All-Out Attack option that lets you do exactly that. Of course, like with most All-Out (Whatever), it has it’s time and place, as +Peter V. Dell’Orto ably articulated. The good thing about this one is that it’s open to everyone. Is all it costs you . . . is your ability to defend. If you hear evil laughter in the background, your ears are not deceiving you. attacking a foe that can’t reach you. attacking when your defenses aren’t good enough to matter anyway. attacking when you’re confident that your extra offense will nullify the chances of being attacked back (or attacked back effectively). attacking when your allies can keep you safe from harm. attacking a foe that can’t really bother with you. So the question “Why would I ever do this?” is “Sometimes, it’s a good idea.” It’s never been a good idea to do it all the time, but that goes for a lot of maneuvers. It would only be worth getting rid of if it was literally never useful, and other maneuvers filled its niche in a superior way. It’s conditionally useful, and nothing fully replaces it. OK, great. So you’ve got the universe’s permission to All-Out Attack – why use Double? Well, for one, if you’ve a lot of skill and your foe has defenses not boosted by skill, such as high-DB shields, Combat Reflexes, fencing weapons or martial arts skills that give extra-good retreat bonuses on a parry, or with high Dodge but lower skill, you can Feint-and-Attack. This is a great way to smack down defenses to a hittable range in this case. If a foe might require a lot of individual hits – perhaps because they’re diffuse or something and the best you can do is one HP per blow, this one might be for you. Also, if you do a whole bunch of damage and are pretty sure you can hit twice, then you’re effectively doubling your damage output. And if you’re playing a DF warrior with Weapon Master or something, swinging a sword for 3d+7 – well, sometimes your foe is just a big bag of HP, and you need to hit him a lot. Finally, this isn’t the end-all/be-all. You can stack this with some the three other choices below, replacing one of your two attacks from your maneuver with either a DWA or set of Rapid Strikes, and then after that, add however many levels of Extra Attack you have. When not to do it? Any time you might need to defend, obviously. You also might need to choose a different AoA option for some reason – Long, Committed, and Strong all have their place. Unlike the other options, this one costs points. A lot of points, actually: 25 points per attack. That’s enough to buy +6 to skill even after you are in the 4 points per level progression. The other thing about Extra Attack is that it more or less limits you to one blow per limb. This is mostly clear from p. B53, and made explicit with the Multi-Strike enhancement, from GURPS Martial Arts (p. 44). For 30 points instead of 25, you can hit twice with the same attack, probably your best. Extra Attack or even two of them with your best weapon costs 25/30 points for one, and 50/60 for two (if you can only do Extra Attack with one weapon skill, you’re back down to the lower cost). 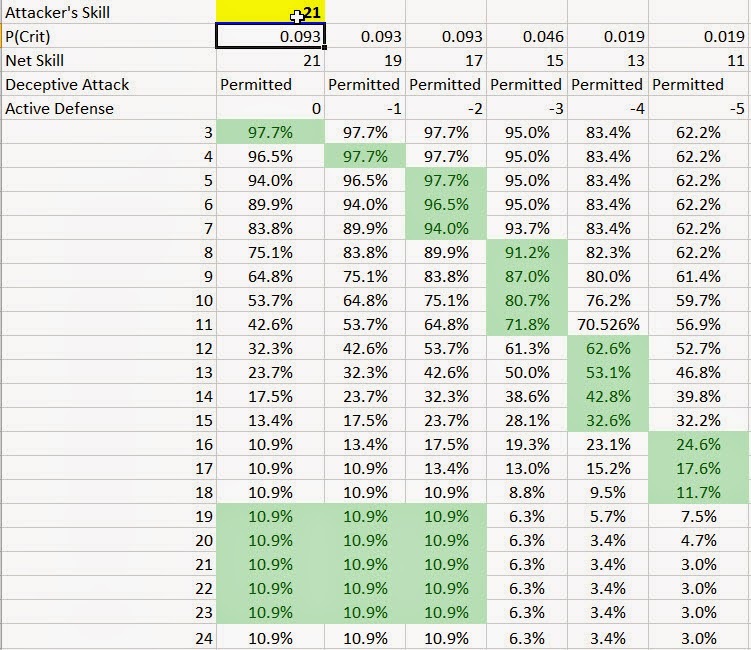 Even focusing on a single extra attack (30 points), you’re looking at giving up +7 to skill, which also brings with it a likely +3 or +4 (if your skill is odd) to Parry, which Extra Attack does not do. So would you ever spend those points on Extra Attack instead of skill? Not really . . . if you’re a human using one weapon. And if you’re only using one weapon, you’re back down to 25 points, because you buy Multi-Strike at +20% and One-Weapon at -20%. Cancels out. But if you have four arms, you’ll want a bunch of Extra Attacks, because the basic rules say you can get but one Rapid Strike. Oh, sure, Martial Arts says you can have as many as the GM will permit, at -6 each, but the Basic Set rules say you get to turn a single small-a attack into a Rapid Strike. Extra Attack is good at mitigating that. If you can use Rapid Strike a lot, and even more so with Weapon Master to halve those Rapid Strike penalties (though that’s not cheap), it’s still probably better to buy skill. The 25-30 points vs +6 to skill thing works if you have one skill. If you have two (Sword and Shield, Grapple and Strike), then getting Extra Attacks starts to look like a good deal, because you have to buy them all up to make the trade-off as straight-forward as presented. I’ve talked about Rapid Strike and Dual-Weapon attack before, first trying to collapse them into one thing, and another recasting DWA as a Committed Attack. The basic premise of Rapid Strike is that you can accept a -6 to skill (which is a lot) in order to attack twice. You have to be good to do this. The odds of hitting more often striking twice with a -6 vs. once at flat skill only favor two attacks at skill 20+, and probably 22+, because at 20, the -6 gets you to 14, which is a crit on a 3-4, but your higher skill is a crit at 6. 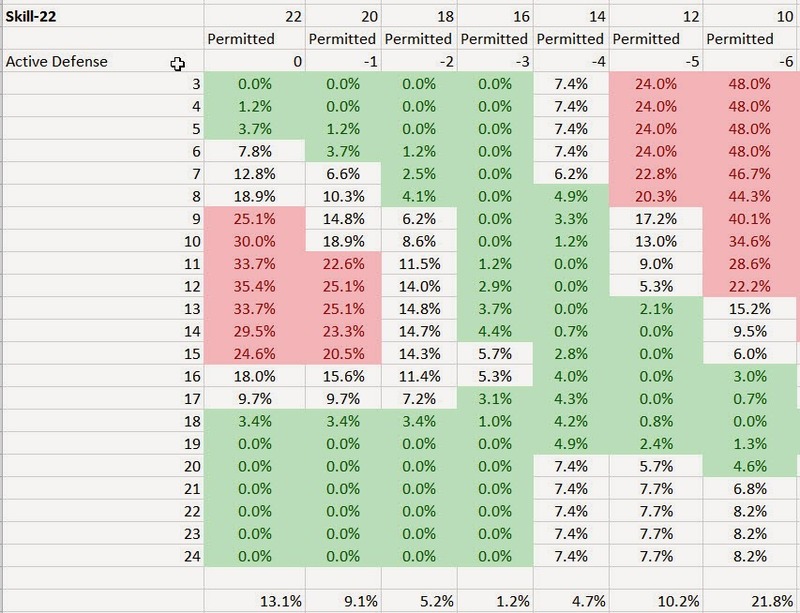 Now, if you have Weapon Master, which halves your RS penalties to -3 each, the transition point is a skill of 17+ where you go ahead and strike twice. Of course, that’s just for hits. The damage output turns to favor Rapid Strike (on an undefending target) at Skill-16 without WM, and only Skill-12 with it! How does this work? You have a damage output of 100% on any given successful blow. So your damage per strike is your hit probability times your damage. I use 100% for convenience here. But for RS, it’s the probability you hit once, times the damage output (100%), but you add the odds that you’ll hit twice, and if you do, you add another 100% damage. So basically, the odds you hit at least once, plus the odds you hit both times. The damage per turn argument can be strong; you’ll hit more often with a single strike but the increased chance of hitting twice really ups the return on your investment. You still need Skill-21 without Weapon Master to make it worthwhile from a damage perspective. 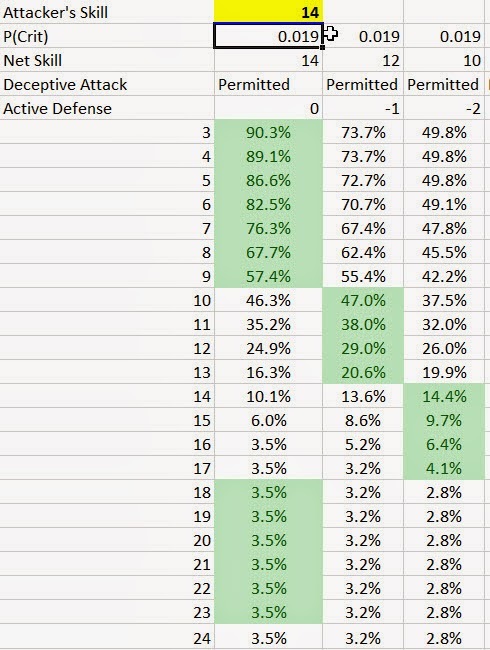 In either case, once you hit a net skill of 16, any surplus skill you might have goes to Deceptive Attacks, which lower your foe’s defenses. Rapid Strike with ranged weapons probably seems the same as melee, but the often humongous penalties you take for range really put the emphasis on “shoot once, shoot well.” If you’re at 30 yards for a -7 penalty, that basically comes off the top. So your break-even with the -3 (Gunslinger) is Guns-24 (! ), while with mundane skills it rockets to a pretty inhuman 27. Rapid Strike does not come with the baggage of not being able to use the same weapon twice, so you’re good here so long as your weapon doesn’t become unready. As noted above, I have a thing about Dual-Weapon Attack. Not sure why. It just seems like it serves the same purpose as Rapid Strike but invokes a whole host of special rules. But no matter. It requires you to use a weapon in each hand, and is -4 per attack. You do get -1 to your foe’s defenses, which helps that blow strike home. DWA is a good technique if you routinely carry two weapons (or a weapon and shield) that can and maybe should be used independently. DWA allows you to preserve your defenses and is stackable with all the various attack maneuvers, including one of the two of an All-Out Attack (Double). You’re better off DWA over even a single attack for hit probability at Skill-18, and per-turn damage output at Skill-14, both easy reach of even moderate-point adventurers. DWA has some nice features for ranged weapons, too, since some special attacks let you DWA with two arrows at once with one draw. Technically it’s twice the mass and should probably be -1 per die to damage, but who cares because Legolas is awesome, right? You’ll want to throw multiple attacks when you can, especially in melee. “When you can” will mostly be when you have pretty high skill, or decent-to-high skill plus an advantage like Weapon Master. The All-Out version is risky, of course. Leaving yourself defenseless is a bad idea unless you know you will be unmolested, or are sporting so much overall DR that you can ignore stuff. DWA makes a great go-to tactic if you build your guy around that. An edged shield plus a balanced weapon makes for a great combo, but since you really do want both skills at 14-18, you’ll want to ensure you don’t waste points to get there. Alternately, for the two-weapon set, a pair of shortswords lets you dump all the points in one skill. The high cost of entry of Rapid Strike (-6 per extra shot) means that unless you have points to burn on Weapon Master, you do this when you’re so good nothing else matters. And if you have enough points for WM, you’re awesome anyway. Finally, Extra Attack. If you’re not using the extended Rapid Strike rules from Martial Arts, this one’s good if you want to exceed the normal maximum for attacks per round (the multi-limbed creature is the go-to example here) or you have many different skills and you want extra attacks with all of them. Shawn Fisher, co-author of GURPS High-Tech and GURPS WW2: Hand of Steel (among other published works) posted a comment to the thread on rules-lawyering that somehow bounced from Blogger. He contacted me offline with the comment, which was fairly extensive – too extensive to be buried in the comments! So here’s more fuel on the fire. I anticipate restrained and level discussion. The very point of rules is to help narrate an adventure game. No GURPS writer will ever be able to write rules that are perfect: That’s an impossible standard. In addition, GURPS authors aren’t trying to do that anyway. GURPS has an official play style that is very important. So the rules are intended for mature people, playing a cooperative game, who are willing to use common sense to fill in the gaps – or fudge results – and who can handle their own problem solving. It says that right on the tin. If you are unhappy with that purpose, play another game: GURPS will never make you happy. So, yes, if you like a particular play style that is at odds with what GURPS writers are doing, according to company editorial guidelines, you are “doing it wrong.” If you expect the rules to provide “the fun,” Robin Laws thinks otherwise. Ken Hite and many others will likely agree with us, and not with you. That’s fine. Ignore us all. But do not come and bang on our door and whine and cry and hair pull that it’s not working for you. It’s never going to! Also, understand that no amount of thinking, writing, editing, thinking, playtesting, re-writing, editing, will produce a set of rules that cannot be misunderstood. Rules are not objective – they are by their nature subjective. Ever read a grammar book, and then the commentary on grammar styles? Game rules are no different. People will inevitably misunderstand the rules. It’s the nature of language. GURPS authors aren’t paid to answer questions on the forums. If we do show up, it’s out of a sense of love for the hobby, and nothing else. I can’t tell you how much “fun” it is to be chided on the forums by people who don’t write books and who can’t read the rules. Or buy the products. Nothing in any of that experience is fun, I assure you. Finally, let me say this. People that have a problem with game rules and playing in a cooperative game often have other problems in real life. This is not directed at anyone in this thread, but it has made me think. I’ve been a gamer since the 1980s. I’ve never met a bad gamer who was a success in real life, or who didn’t constantly have problems with relationships and employment outside of gaming. I’ve met good gamers who were well-adjusted and had successful careers, but the worst rules lawyers and the most argumentative people to ever sit at my gaming table were not the doctors, lawyers, professors, teachers, engineers, and career police and military officers. The worst offenders were pizza delivery drivers, convenience store clerks, and stock room workers, or the unemployed. This is not to deride those jobs (I did those things, and worse, in my college years), but rather to say that there is in my experience some correlation between politeness, propriety, and group cooperation and the ability to hold down a steady job that pays a decent wage. Gamers that do not have real life success often game to experience success through escapism, and when that too is denied, the response can be vicious. Often the very same people who showed up without snacks, a character sheet, or even a character name (call me Bob) were also the ones most intent on misconstruing the rules, mis-adding character points, and generally being a nuisance in other ways. Again, I’m not accusing anyone here of these things, only recalling my interactions with bad players. Make of it what you will. Finally – and perhaps a bit tangentially – the point of a blog is to post one’s opinion, free from censorship of others. Doug’s blog is his place to speak. If a person comes here and posts, it’s like standing in his living room. Be respectful of his space. Over on the SJG Forums, a thread started up that inspired next Thursday’s Melee Academy topic, a cross-blog event where anyone that wants to take a shot at it writes about their favorite way to tackle a given topic. This particular thread is named “unarmed vs. knife,” and the melee academy was broadened more or less to shortish-reach one-handed weapon (Reach C, 1 in GURPS, probably anything that can strike the same tile or adjacent 5′ tiles in D&D). That’s neither here or there. What I want to do is point out something. Somewhere around Post 62 the thread sort of digressed (devolved?) into a protracted back-and-forth between mostly two posters. Sure, others got in there, but mostly it was 60 more long, involved posts that are really taking the letter of the rules, shaking them down for their lunch money, and stuffing them in a locker. Most of this seems to revolve around an interpretation of particular language that is legalistic in nature – the rules say what the rules say, or what you can make them say. This would be somewhat opposed to a descriptive or principles-based approach to the rules and to the game. In this particular case, the general concept of how the various parts of movement – in this case a “step” can be combined seems to be – with some reasonably support by +Sean Punch more or less that the step/movement and the attack are really just one continuous thing. So you can take it as a step, attack, or an attack, then step. Or if you’re doing something that allows multiple steps, you can mix and match. Or if you’re doing Rapid Strike, you can attack one guy, step, then attack another. Basically, try not to be too atomistic about it, and so long as you’re more or less obeying the rules for when you can change facing relative to movement, you can blend your facing changes, steps, and attacks together in a way that represents your continuous movement fairly. Your foe, likewise, should be assumed to be able to do more or less the same thing on defense. The sixty or so posts in the linked thread represent a bit of the extreme opposite approach, as if the rules have to be defended in front of some sort of Gaming Supreme Court of Nerd Rage or something. If you note that I have an exasperated tone in this post, you’re not wrong. Because much as in another parallel thread on the exact parsing of the wording in Committed Attack, I think discussions such as this, that turn on a near Clintonesque view of what the meaning of the word ‘is’ is do not help gaming in general, and GURPS in particular, draw in new blood and new fans. I’m not even sure they help resolve the issues at hand, because they’re so very particular they require a level of system mastery and textual precision that takes a flying leap off the fun mesa, landing messily in the burning abyss below. Unless they’re contract or patent lawyers who really love their job, because that’s what both of these threads remind me of. I’ve had conversations like this with vendors at work, usually when they’re trying to weasel out of delivering what they promised to deliver, because, well, the contract says precisely X, and we can torture it until it means Y, and if you want what you say you want, well, a million bucks, please. This is the purpose of rules. To give shape to the event. To allow us to put bounds around what can and can’t be done. To allow the players to have a common understanding, and again to borrow from pop culture (this time Xander Harris), to define rules, borders, and an end zone. Substitute “rules” for “prophecy” here and I think you’re on to something. That is, rules exist to put gutters and bumpers on the game. 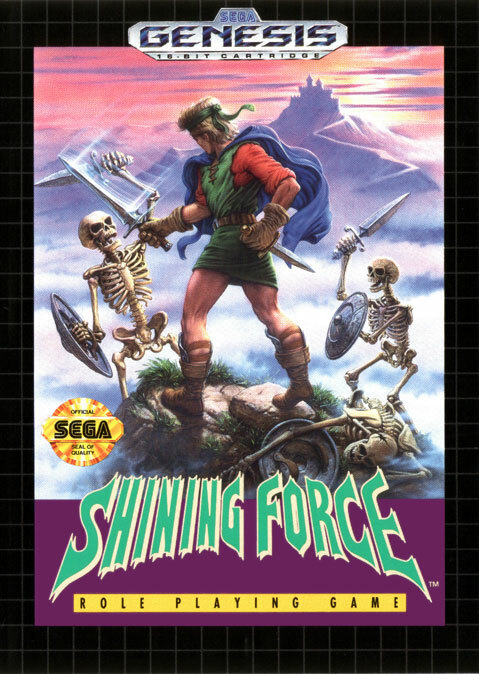 To allow the story and events to evolve without someone flinging the table over or deciding that the game is too arbitrary, and the opportunity cost for playing the game is higher than the alternative: shaving one’s head with a cheese grater while chewing on tin foil. So whenever I see sixty posts worth of not explorations of tactics, but how much you can get away with within the letter, but not the spirit, of the rules, part of me gets frustrated. GURPS doesn’t need that crap, because it suffers from an undue burden of point-based front-loaded chargen, one-second turns that are shorter than the usual time frame within which people conceive of character action, and an attack-defense-effect paradigm that can be festooned with Attack Options and Defense Options. If you take all of this useful color and then require sixty posts to figure out that, no, Clyde, your foe can in fact see you running round him in the middle of a one-on-one combat, and can in fact compensate for such – then you’re turning my favorite game system into something even I don’t want to read about or play. Surely, of course, I don’t have to play that way – and I don’t. But I’m positive Sean, +David Pulver, and +Peter V. Dell’Orto – just to name the authors of Basic and Martial Arts (though I could throw +Hans-Christian Vortisch in there for Tactical Shooting, a perennial fave on this blog) don’t write rules with the intent that sixty posts are required to figure out what is precisely going on here. Now, it is possible to seek clarity with what the rules are supposed to be saying, to determine what kinds of action are provided for, and not be trying to be an evil rules lawyer, but instead serve as the lawful good variant of that trope. Asking if the intent of slicing the pie really does require Step-and-Wait, for example. That’s legit, especially since the text of that passage does seem to require it, but doesn’t call it out explicitly. Asking when, if ever, anyone would ever use the ST-based rather than DX/skill-based options for moving to someone’s side arc when using Technical Grappling? Totally legit. But if you find yourself having a “cool” move hinge precisely on the word-for-word interpretation of several rules from several books? If what you’re trying to pull off only makes sense when looking at a series of moves arbitrarily divided by an equally arbitrary definition of what a turn is? What you’re doing is a rules exploit, and if you get Rule Zero’d, you deserve it. Honestly, as I think of it on the run-around-to-the-side thing, there’s already more or less a consensus that if you want to claim the “the foe can’t defend” that derives from attacking from the back hex, you have to start there. Otherwise, you treat it as a run-around attack, which only treats it as an attack from the side. That’s -2 to defend. I’m almost wondering if a similar logic should apply for side attacks. You only get the benefit of that if you start your turn in that arc. Another way to look at it is to treat the “rear” arc as -4 to defend if you end in the rear hex (bear with me), the side as -2, and the front as no penalty. The penalty to defend is the average of where you start and where you end. Defenses are still minus infinity (no defense) if you start in the rear hex. So a true run-around, starting in the front and ending up in the rear, is at -2 (average of 0 and -4). Start from the front and end in the side? That’s a -1. Start in the side but end in the rear is -3. That gives a game-mechanical benefit to sliding around a foe, but doesn’t invite the kind of hair-splitting the brings the game to a halt and chases away players. Another simple way: if a foe steps around you, go ahead and let them make a single hex-rotation to follow you as part of a defense, and two or even three rotations combined with a retreat. This has consequences of its own, of course – it might open up the back to your friends – but it would also make clear what’s going on in that run-around attack, and show why you get that -2 instead of no defense. The game presume you’re not standing frozen, which is exactly what you’re not doing in a swirling melee. Bad Sight is tough on a PC. It’s a -25 point disadvantage and carries some serious ouch to it in either nearsighted or farsighted varieties. What if you want to have just slightly bad vision? Fairly easy: just make it leveled. I’m going to tweak point cost a bit as well. You have issues reading things more than one yard away. You are -1 to your Vision roll per level of this advantage. Additionally, you are at -1 to hit for every three fractional levels of Nearsighted (so Nearsighted 2 gives -1 to hit, but Nearsighted 7 gives -3). Apply the same penalty to ranged attacks. Why it’s different: This is just a straight-up scaling of Nearsighted, at 4 per level, with no cap on levels inherent. The “double range” thing is the exact same thing as a -2 penalty, which coincides with the -6/-2 for melee. So using the same penalty for all attacks works fine, I think. You have issues with very close objects. Each level gives you -1 to spot objects within one yard, and each two levels (or fraction thereof) gives -1 to DX on close manual tasks, and close combat. Rolls to maintain or improve a grapple, or execute grappling-based techniques (grapples, throws, locks, etc.) suffer penalties based on the best of your senses of touch and vision (so if your touch-based senses are unimpaired, so it is with your grappline). Any attack that bears a close resemblance to a strike (such as a Sweep that does not start from an already-established grapple) suffers full penalties. You have poor vision in general, suffering -1 to Vision per level of Bad Sight, -1 to melee and ranged attacks per 3 levels, -1 to DX for close manual tasks and close combat per two levels (or fraction thereof in both cases). Acute vision is already leveled but doesn’t give bonuses for melee or ranged tasks, nor for close manual tasks, nor bonuses in close combat. So the price is fine as-is. This came up when my instant response to the question “can you be both nearsighted and farsighted” was “just buy Reduced Vision.” Turns out you can’t. Easy enough to tweak out. I didn’t feel like 6 levels of bad vision would be worth -48 points, though. 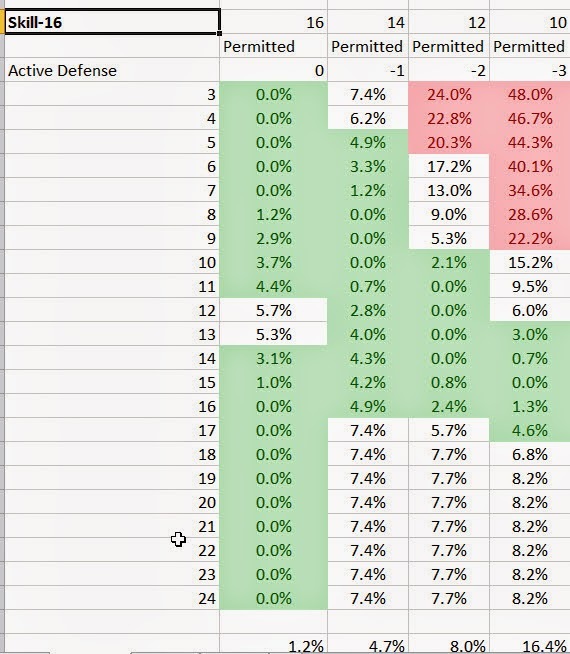 Even with -6 to vision, -2 to melee and ranged attacks, and -3 to close manual tasks and close combat, which if “anti-Acute Vision” is -12 of those points, those penalties work out to another -35, which is about -2 to DX on all tasks. I suppose you could go either way, at -6 or -8 per level, but I chose to use the lower total. Nearly -50 points seems pretty catastrophic. On the other hand, if it’s correctable, it’s basically -20 or -15, which starts to feel about right. So, I made a small error in my original sheet yesterday, but I’ve replaced it with the right math. I also upgraded the sheet to show the relative delta in absolute percentages from any given choice to the best choice for that defender. That’s what led me to conclude, basically, that there really is an answer to the question of “what’s the optimum deceptive attack” strategy. There’s one caveat, though, which I’ll throw out in the beginning as a clause. 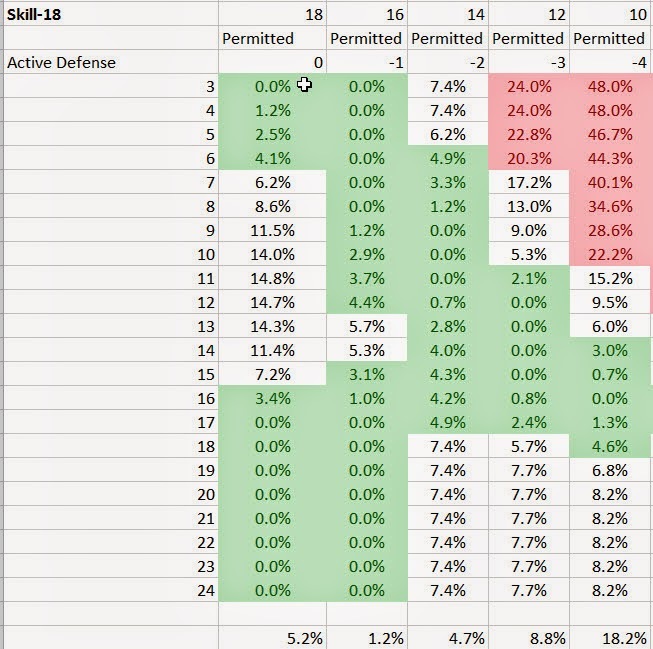 Provided you don’t know the defensive skill of your foe, the best strategy overall is to Deceptive Attack with “surplus” skill down to a level of 16. What is “surplus” skill? Well, like mentioned in A Surplus of Awesome, you can hit important stuff, target limbs, Rapid Strike, and other things. Once you’re done that, it’s time for Deceptive Attack. Hit chance = P(Crit) + (1-P(Crit)) * P(Hit) * P(Fail Defense). What this should really be is the probability of a crit, plus the probability that a non-critical hit strikes home. That should be [P(Hit) – P(Crit)], since (1-P(Crit)) includes misses as well. So in my formulation, I’m subtracting a smaller number from the total, by the amount of P(Hit) times the last term in the maroon equations. That will be a small reduction for large skill (where P(Hit) is close to 1), but can get significant at low skill. In any case, it’s fixed now, so the numbers should be basically right. So I’m going to start at a skill level of 13 and go up by 2 through skill 23. I’m not going to focus on the actual percent chances to hit much, but I’ll give some examples of the charts. You can see for Skill 14, there are only really three levels for DA. None, -1 to defend (-2 to Hit), and -2 to defend. Based on the “pure” answer of what’s the best choice for any given defense, you can see there’s no one best answer. 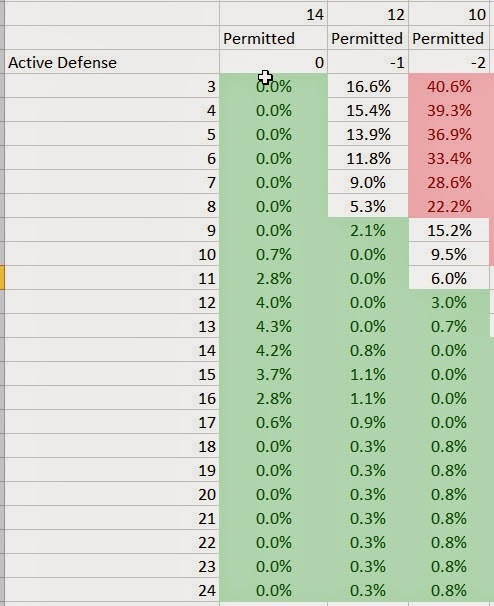 The odds of getting a hit in at all depend on how much skill your defender has. If you know what that is, of course. If you’re fighting yourself, let’s say with stats in the 10-12 range, you’re probably looking at a base Dodge of 8 to 9. That could be as low as 6 (due to Committed Attack’s -2 to Defenses) or up to 12 or 13 (Combat Reflexes and a Retreat). Parry will start at about 10, and with a medium shield, Combat Reflexes, and a retreat can be up to 14, but as low as 8. So defenses will be from a low of about 6 to a high of 14 . . . and that’s on one foe. His maneuver choice means his actual effective defense can change turn to turn as well. Given that, you’re either at full skill or -2 to hit for a 12, but how to choose? Let’s look at the relative matrix. I’ve color coded the differences, taken in absolute terms from the optimal choice. Green is less than a 5% difference between the cell in question and the “best” cell for that row, and red is larger than a 20% difference. What you see here is a bit differently put. While the very best choice changes a bit, you can see that it can be an actively bad idea to do heavy Deceptive Attack vs. inferior foes. In fact, vs. Joe Average and his Dodge-8 and likely Parry-8 (Weapon skill at DX 10), you are worse off than optimal (which is no DA at all) one time in 4-5 tries. Shooting down to 12 isn’t a bad choice either here, though again it’s not optimal against very bad or very good foes. 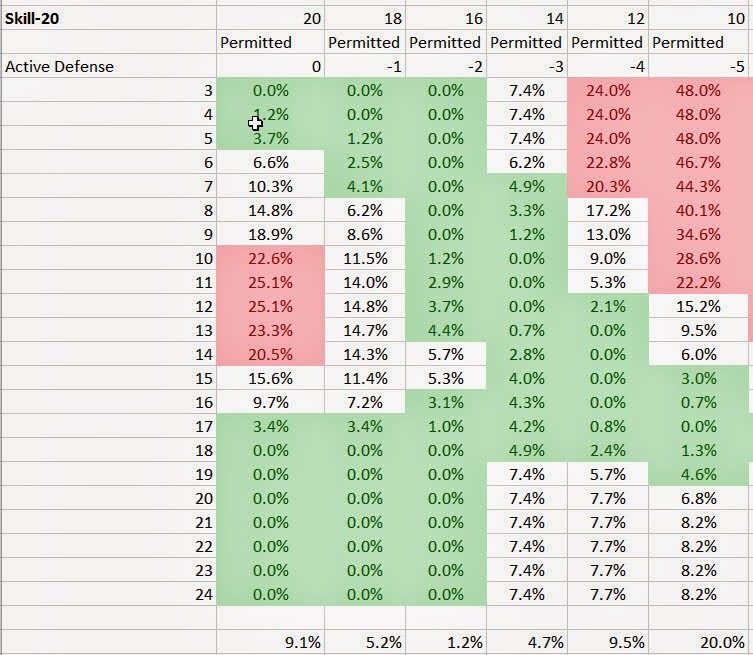 Still, the surprise here is that if you’re not fighting a total incompetent, you will not be overly penalized in total hit chances by any level of DA that you can throw, but by and large either 14 or 12 are your best choices. In fact, the one that’s either the best choice or within 5% of the best choice (making no difference more than 1 time in 20) is no Deceptive Attack at all. You can get to this by math, too: take the average deviation of all the potential trials listed. The lowest deviation is no DA for skill 14 and 15. Now, that heavily weights Defense 17+, which is “fishing for critical hits and defensive critical misses” territory, but it does it equally, so I’ll call it indicative. This skill level is good but not the top you can get to in a starting DF character if you optimize a bit, and not even close to the top if you’re into Monster Hunters or (god forbid) Black Ops. You can see from a pure math perspective that which is the “best” strategy changes quite a bit depending on your foe’s skill. Anything from no DA to the most DA you can throw is viable at some point in the spectrum, and someone with Skill-21 has a base Parry-13, likely with CR, maybe some enhanced defenses as well, perhaps enchanted armor? Parry 17 is not out of the question here, but that’s still not completely in the “crit fishing” range. Still, what about if you don’t know your foe’s defenses? DAing down to 15 is either optimal or within 5% of optimal i the largest range of circumstances. Lacking other information, it’s the best option in many cases, and a pretty good option in nearly all cases. Even the one cell that’s not green is only “not green” by 0.3%. 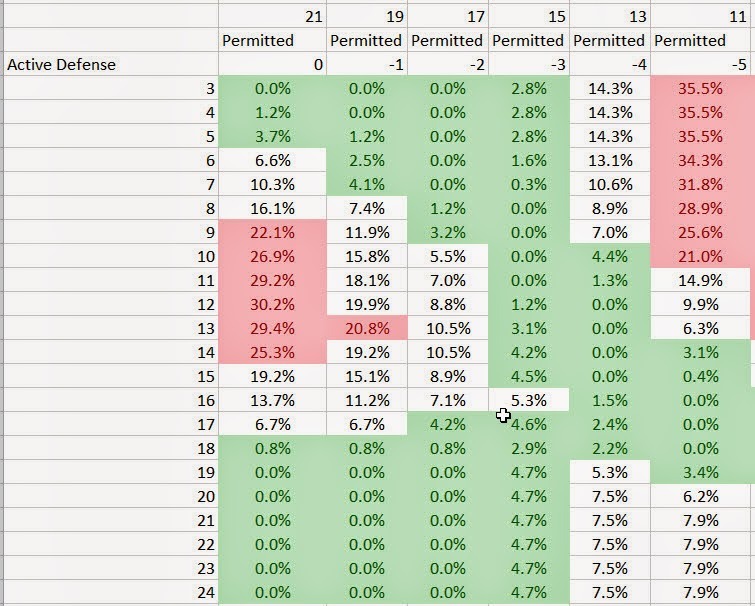 Going down to 13 gets you very little, and only against a select few foes. Choosing 17 against middle-ground foes is actually a poorer choice, but it’s good against those of much less or much more defensive ability. Now a Bunch of Tables with Few Comments. Rather than comment on each, I present Skill 16 through Skill 22 counting by 2, then jump to Skill-30. 0.00% means that’s the best result you can get for that row. In all cases, the average result is best to DA down to 16. There are areas where DAing down to other values are locally best, but you have to know your foe’s defenses precisely in order to get this result in many cases. Since even lousy foes can be lower in active defenses by 2 without actively giving them up (Committed Attack, being grappled by RAW, being in several postures, even -3 for lying down, -4 for stunned) and can eke out +3 for retreating Dodge, and with the right mundane advantages and equipment can pretty easily hit +4 to Parry, you’re really dealing with a range of defenses on any given foe that’s around 5-8 wide. So Defense-10 can vary between Defense-6 and Defense-14, though honestly it’s really smaller than that unless you’re dodging, at least on the high end. There are limited ranges where more DA than the 16 global best average answer are appropriate (and by the way, if your net skill happens to be odd, you want 15, not 17). If your foe is sporting a defense value of 7 + half your skill, you maximize your chances by going all the way down to 10. (You of course, give up increased chances of critical hitting, and increase your chances of missing entirely). But in every case, your odds have been increased by . . . 1%. You will take advantage of that extra optimal hit chance one blow in 100. The sweet spot for DAing down to a skill of 12 is about 4.5+ Skill/2. So for a good warrior of Skill-16, if your foes are in the 12-13 defense range, this is where you want to be. Note that in an equal battle . . . this is where your foes will be. Parry starts at 11 with Skill-16, and with a retreat, combat reflexes, or just a medium shield you’re in the “go down to 12” category. So if you’re willing to give up crits and you’re fighting a foe basically as skilled as you are, this is your target. However, this will only make a difference about one time in 16 relative to the critical effects you give up by doing this from Skill-16. If your foe is half your skill, DA down to 14. But again, you’re looking at this making a difference from between one time in 25 to about one time in 50. If your foe’s defenses are equal to your skill, buy down to 16 and no further. You’re crit fishing here, and buying down is actively bad. 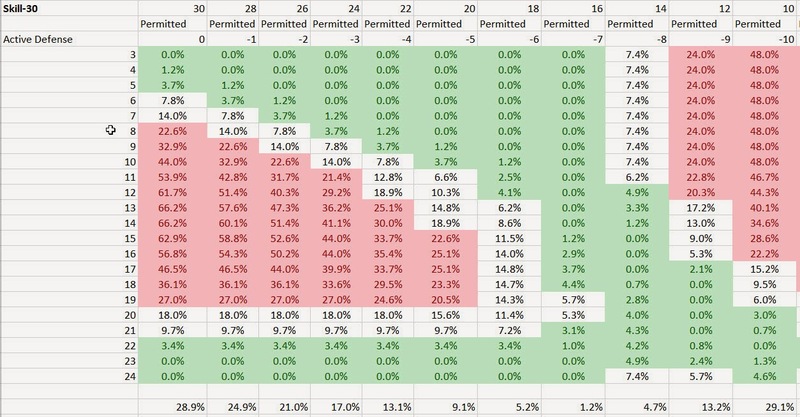 If your foe’s defenses are even one less than half your skill, again, stay at 16 – the biggest impact to your hit chances here is your own lowering of your base chance to hit. They’re so hopeless that them making a defense roll will be an active surprise. But as the graphs show, all of this is at the margin. +Peter V. Dell’Orto summarizes some of the benefits and pains of maximizing critical hits and minimizing critical misses in one of his posts on the thread that spawned all these charts. Those can be inflection points in fights, and so they’re more important than raw “did I hit him with this particular blow” might show! What the heck? Why do all this? Honestly, my curiosity got piqued. Peter’s been playing DF for years, and literally wrote the book, along with +Sean Punch, on Martial Arts. I’ve heard varying opinions on this issue from lots of people, and even some charts, but nothing quite as comprehensive (or iterative) as I did here. I thought the color coding of marginal benefit was illustrative. And they key, as always, is knowledge. If you know your foe’s defenses and the only goal is maximum chance of hitting per blow, there probably is a numerically best answer. But a few things did surprise me. The easy answer to “what to do with skill less than 16” is “nothing.” Swing away, but don’t waste time on DA. Note that’s NET skill. If you have Skill-14, but win a Feint in a duel and then have to attack a superior foe . . . you might well want to DA to 14 or 12 on top of a Committed Attack. But Deceptive Attack is what you do when you’re awesome, either permanently or temporarily.